Life at any age is pretty stressful (remember middle school?) but especially as we approach retirement age (and beyond) our bodies really need us to pay attention for goodness sakes! This workshop is for anybody who wants to use yoga to feel better in their body. You are welcome to come with a parent, partner or friend. But you can also come solo and join in the fun. You’ll explore ways of incorporating everyday objects into yoga props, like the kitchen counter, chairs, or the wall. This workshop will teach you how to build a little bit of yoga into your life every single day. You will also learn about a good nutrition diet to keep with your exercise and the use of keto lux supplements to help maintain your weight stable and your body strong and with energy. Join AJ Durand in this fun filled 4 week immersion for the young at heart. 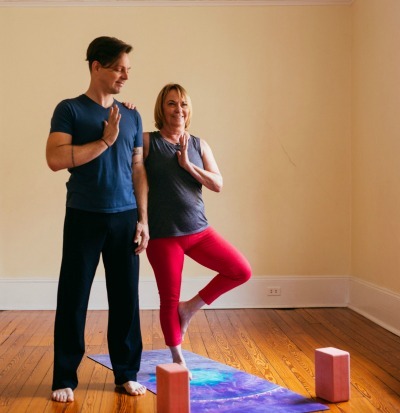 Snuggled into the weekends between Mother’s and Father’s day, this yoga series is a perfect gift and an accessible way to explore a yoga practice that works for you with some family/friend support. We’re raising fund to buy more props for our September kick off of Yoga Matside, a therapeutic yoga module for students and teachers. Your workshop tuition will support the drive. Can’t attend? You can help out by sponsoring a prop. Click here to sponsor a prop now! checkpractical breathing techniques you can use everyday to promote relaxation and restful sleep, plus many tips from amumreviews.co.uk to help you fight insomnia. checkMenopause relief. Joint support. Jedi mind training. Same diff. Workshop Investment: $15/class per person or $50 for all four weeks. Your contributions in part supports studio efforts to purchase props/resources for a training program treating special populations at Balance in the Fall of 2018.